Over the past couple of years, COBRA has been making some serious strides with its lineup of drivers, fairway woods, hybrids and iron sets. Many of the irons sets produced by COBRA have been very well-received by pros and amateurs alike, especially the irons sets for ladies and seniors. The full COBRA Amp series is pretty good, too. 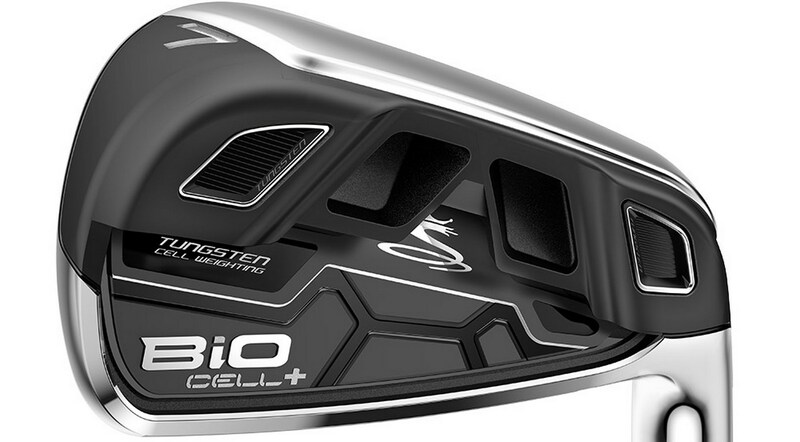 2014 COBRA BiO + CELL Irons set face. Much like the regular COBRA BiO CELL Irons, the head of the BiO CELL + irons are made of various combinations of multi-materials. Tungsten weights are placed toward the perimeter of the heads in the 3 to 7 irons and then centered with the lower irons. The head is slightly smaller with less offset, too. The head material is a softer 431 stainless steel with a smaller undercut. Meanwhile, the clubhead’s topline is a little on the thick side. The stock shaft is a True Temper Dynamic Gold. The sole of a new COBRA BiO CELL Iron. Feel? What feel? Making a few passes with the 7-iron, I was not getting any real feedback on my solid hits versus my miss-hits. I’ve said it before and I will say it again… a Dynamic Gold shaft with a multi-material head is not going to provide feel for most golfers. I kept waiting to feel the “soft” part of the clubface. Yep, it is definitely a case of how well the iron works being better than how the iron looks. My ball flight was high and landed softly. It goes where I aim it. I was not able to work the ball very well, but there was certainly nothing wrong with hitting it where I aimed it. I was hitting inside, but I do get the impression that this iron would have no problem getting through tough lies. I was about an iron longer than standard for me, so the distance aspect was a pleasant surprise. The new COBRA BiO CELL + Irons come in a variety of its signature sharp colors such as red, blue and orange. If you can stand looking at the thick topline, don’t care about the feel of the club head, and just want to hit it straight, high and farther than your normal irons, then you should give the COBRA BiO CELL + Irons a look.